It took three days of intense play, but a winner has finally emerged in the 2014 World Series of Poker Event #29: $2,500 No-Limit Hold'em. 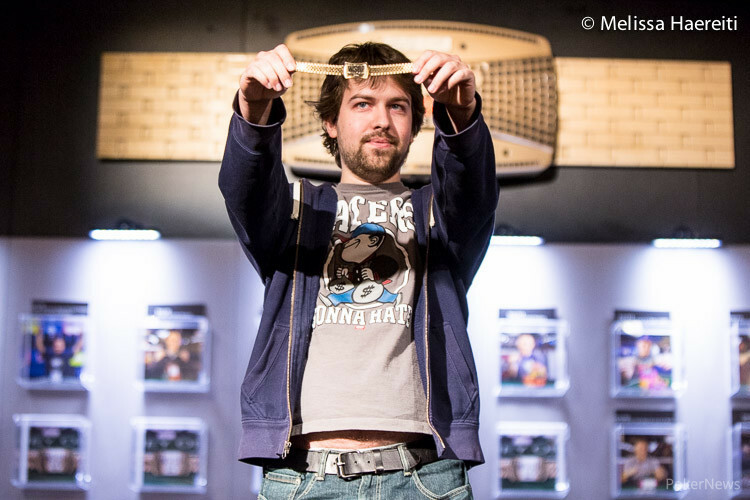 After 30 total levels of play, Pierre Milan topped a field of 1,165 players to capture the $536,768 first-place prize and his first gold bracelet. Interestingly, Milan defeated Justin Oliver heads up to win. 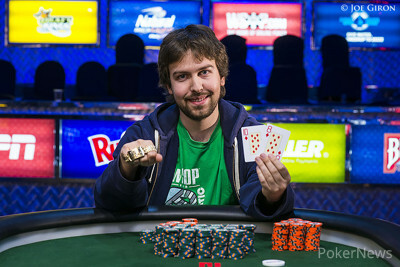 Oliver took down the 2013 WSOP Event #38 $2,500 No-Limit Hold’em Four Handed for $309,071 and ended up giving that gold bracelet to his dad for Father’s Day. Unfortunately for him he was denied his second bracelet on Father’s Day. Day 3 action saw the final 20 players return to Level 21 (5,000/10,000/1,000), and it didn’t take long for the first elimination of the day to occur. It happened when Jamie Armstrong opened for 20,000 under the gun and Richard Kirsch called him from the small blind. The big got out of the way and it was heads-up action to the flop. 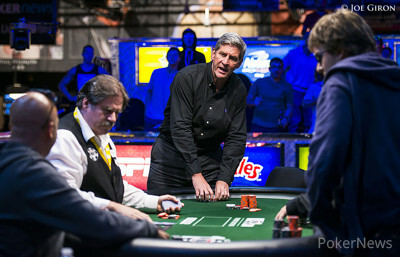 Kirsch was first to act and wasted little time in moving all in for right around 135,000. Armstrong called. Kirsch flopped a flush draw and decided to play it strong. Unfortunately for him it did pan out as the blanked on the turn followed by the on the river. 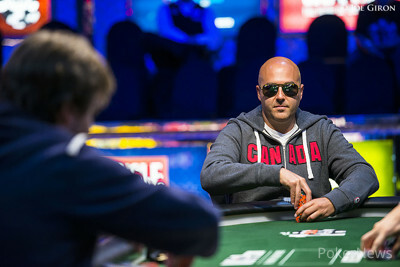 Kirsch became the day's first casualty and took home $16,220 for his 20th-place finish. From there ten others followed him out the door before the final table was set including William Reynolds (19th - $16,220), Rep Porter (18th - $19,718), Joseph Brattole (17th - $19,718), Justin Kindred (16th - $19,718), Marius Pospiech (15th - $24,277), Grayson Nichols (14th - $24,277), Yong Lu (13th - $24,277), Scott Davies (12th - $30,267), Chris Johnson (11th - $30,267), and David Benefield (10th - $30,267). After a dinner break, Sam Cohen hit the rail in ninth place after her failed to overcome the [1d10s] of Justin Oliver, and she was followed out the door by British pro Daniel Laming, who had his pocket kings cracked by the ace-queen of Matt Salsberg. Andy Phan took his leave in seventh when his pocket queens fell to Barry Hutter’s big slick when an ace spiked on the river, and then Oliver put a bad beat on Armstrong to send him home in sixth. After a short-stacked Hutter fell in fifth place, the four-handed battle waged until Thad McNulty and Matt Salsberg, who were the short stacks, fell in fourth and third place respectively. That left Justin Oliver and Pierre Milan to battle heads up essentially even in chips. Even so, it took just three hands for a winner to emerge. That’s because the two played a big pot on the second hand of heads-up play, which went to Milan. One hand later and it was all over. Congratulations to Pierre Milan, winner of Event #29: $2,500 No-Limit Hold'em for $536,768. 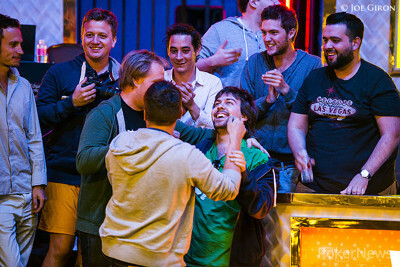 Pierre Milan, at one time the short stack, storms back to capture the WSOP Gold Bracelet in event 29. Hand #132: Pierre Milan moved all in from the button and Justin Oliver called off from the big blind. Oliver got it in good, but he would be denied his second gold bracelet as the board ran out to seal the deal for Milan. Hand #130: Justin Oliver received a walk. Hand #131: Justin Oliver raised to 200,000 on the button, Pierre Milan three-bet to 525,000 from the big blind and Oliver called to see a flop. Milan continued for 425,000 and Oliver called. The landed on the turn and Milan bet 1,225,000. Oliver raised all in and Milan called immediately with the slightly smaller stack. The river was the and Milan's rail exploded as their man scored the double up. The all-in amount was 3.295 million. Hand #127: Pierre Milan raised to 200,000 from the small blind and Justin Oliver defended the big to see a flop of . Milan continued for 245,000 and Oliver folded. Hand #128: Pierre Milan raised to 160,000 from the button and Matt Salsberg moved all in for 795,000 from the button. Milan folded. Hand #129: Justin Oliver raised to 200,000 from the button and Matt Salsberg moved all in for 1.015 million from the small blind. Pierre Milan called from the big blind, and Oliver got out of the way. Milan had woken up with a monster in the big blind, and Salsberg was in a bad spot. The flop did little to give Salsberg hope, and neither did the turn. 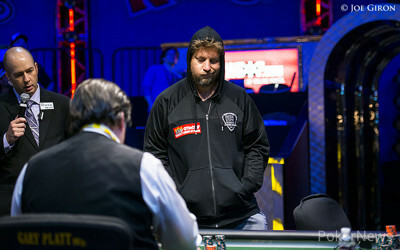 The would be the final nail in Salsberg coffin, and he earned $207,842 for his third-place finish. Hand #123: Pierre Milan limped from the small blind, Justin Oliver raised to 225,000 in the big blind and Milan called. They checked to the river of a board where Milan bet 200,000. Oliver folded. Hand #124: Matt Salsberg shoved for 795,000 in the cutoff and collected the blinds and antes. Hand #125: Pierre Milan raised to 160,000 in the cutoff and received no action. Hand #126: Justin Oliver opened to 200,000 in the cutoff and Thad Mcnulty three-bet shoved for 595,000 on the button. Oliver called. Event #30 Champion Calvin Anderson!